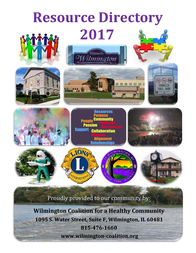 For the past 7 years, the Wilmington Coalition for a Healthy Community has partnered with School District 209-U and St. Rose Catholic School to deliver the evidence-based Lions Quest prevention curriculum to elementary school students. More recently, Project Towards No Drug Abuse was added for high schoolers. Another partner, Robert Crown Center for Health Education, is working to offer a heroin prevention curriculum at the high school level. Shorter-term educational efforts focusing on substance abuse and mental health are also provided by other community partners, including Riverside Healthcare and AMT Counseling. WCHC’s youth leadership team called the CAT Crew also provides critical planning and volunteer support to opioid education projects in Wilmington. These youth benefit from education and training in substance abuse prevention through Cebrin Goodman Training Institute, a statewide youth leadership development program.